Are you looking for Raleigh Dog DeShed services? Woofinwaggle is your premier dog wash and grooming facility in the Raleigh area. In our Dog Spa, or Woof Spaw, as we call it, we use special deshed products made in the U.S. to help loosen your dogs hair. Woofinwaggle is now pleased to offer deshed treatments in our Woof Spa! Our complete de-shedding process includes using a deshed shampoo, scrub, deshed conditioner and more scrub. 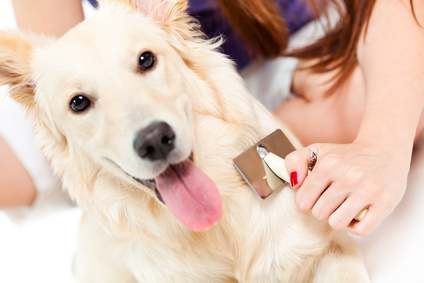 The end result will help loosen your dogs hair and undercoat. Typically the next 24 hours clients see a significant loss of the coat and then the shedding calms down. We often suggest this process be done every 2-3 weeks until the winter coat has been completely thrown. Contact us to schedule your dog de-shed appointment in our Raleigh Dog Spa by calling 919-249-9663 or book online here.